I normally don't like all-star bands, because more often than not what we get is far less impressive than what the members do in their regular bands. When it comes to a Luxembourgish punk all-star band, you have every reason to be sceptical. Vocalist and guitar player Jean-Luc is well known from local ska punk veterans TimeSickness, bass player Giordano plays with Last Millennium Suckers, drummer Eric normally sings with anarcho punks Rise-Up and new member Jeff used to be the head behind the local and now defunct emo kings Carefree. So many different styles (although only from bands on Winged Skull Records), all merged into a single melting pot, can this actually work. Well, it certainly didn't for the cover artwork, which is an amateurish black ink drawing, hopefully not scaring people away from the actual album. Startin' With Dreams, Ending With Memories takes some time to work, but once you listened to it a couple of times, you notice that this is much more than just a clash of the egos, but rather a deeply personal and strongly melancholic street punk album, strangely enough surpassing most of what the members do in their main bands. Jean-Luc's grating vocals fit much better in the context of this punk band, as his snottiness is mostly lost in the ska-ish attitudes of TimeSickness. Where Rise-Up may be to anarchistic, and Carefree maybe too whiny for some, and if you are bothered by the gloomy atmosphere of later Last Millennium Suckers, then you might just enjoy Broken Stars. Not that their original bands are bad, but somehow the surprise works really well here, with something everybody thought started out as a side-project, now emanating true band spirits and a wild punk sadness that could work as the offspring of Leatherface any day of the week. 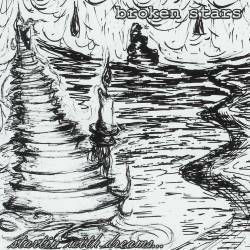 And after ten songs, when you think it might just be enough for now, Broken Stars surprise with the two best songs on the album. A Tribute is a more laid-back folkish punk song (with mandolin), and Home Will Never Feel Safe Again is a truly bred ballad with acoustic guitar and piano. The album could have needed more of this softer stuff, which emphasises the band's talents even stronger, although their own material (Birds Are Singing Me To Sleep, Save Yourself, What's With The Tears?) is no worse. Attention though, the album needs some runs until it really works, but once you're hooked, it won't let loose again. This may be the one album to unite the older punk fans and the newer generation. Possibly the best local punk surprise in ages.